I have some color changing polishes to share with you today. 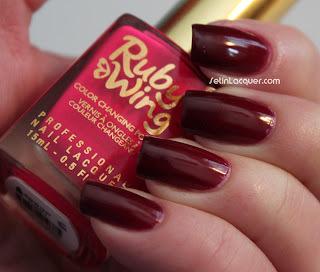 Ruby Wing graciously sent me two phenomenal shades to review. I was trying to wait until the sun peeked out and the temperature warmed up; but as I looked at the forecast for the next week I realized Mother Nature had decided not to grace me with Spring's presence yet. So I decided to brave the cold weather and tromp out in the snow to test out these polishes. These polishes are color changing and scented. The scent isn't overpowering and is actually quite pleasant. But if you are sensitive to odor you may want to use these in a well-ventilated area. However for me the scent was springlike and much more pleasant than the smell of normal polish. Let's move on to the polishes. Poppy - is a bright pink shade before it transforms in the sun. This is two coats. The application was smooth and even and it dried to a high gloss shine. Then I took Poppy outside. I thought it would take a while to change colors. It transformed almost immediately to a deep wine color. 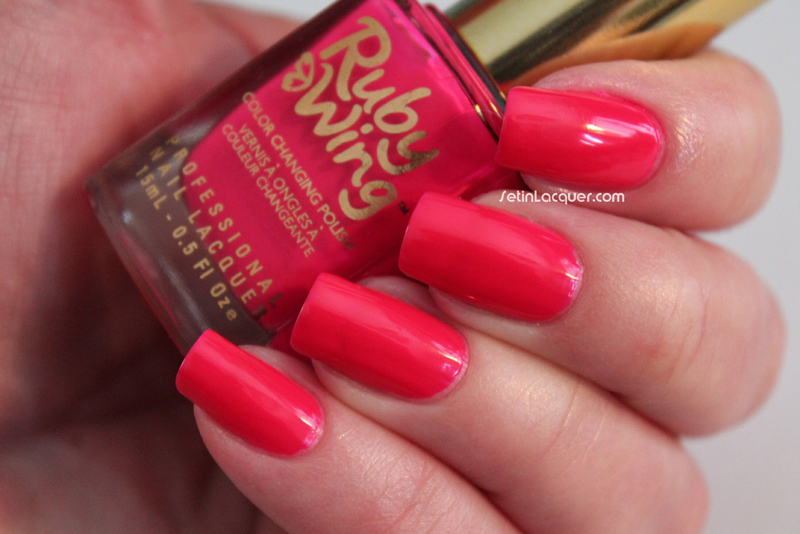 I love this shade! It took a couple of minutes to change back to the original color once I came back inside though. Sunflower - is a glittery gold glitter on immediate application. 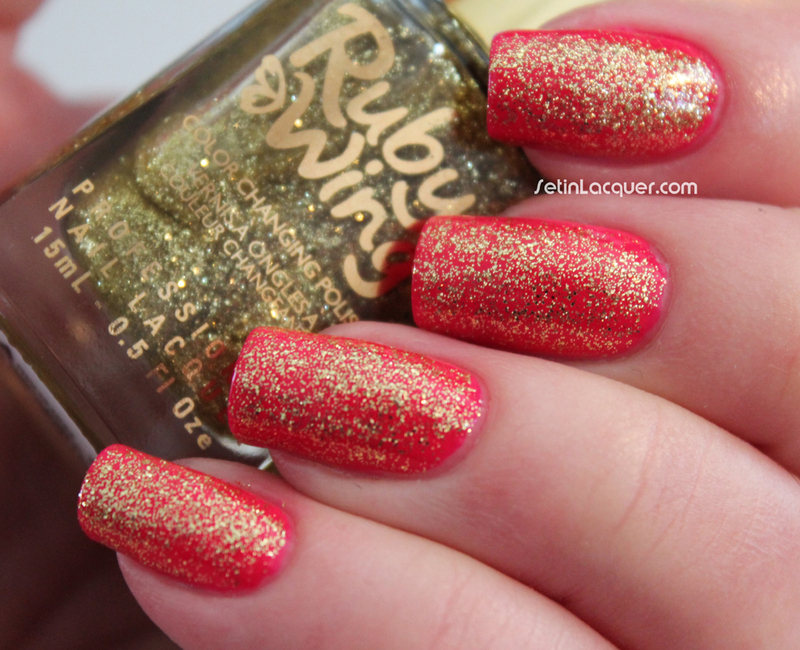 It adds a gorgeous shimmer and applies evenly. The surface wasn't rough at all. The glitter had a smooth surface. I have it on over Poppy. Then I took Sunflower outside. It changed to a bronze shade and the color change of Poppy as the base coat gave it even more of a dramatic look. I am going to have to try more of these color changing polishes. 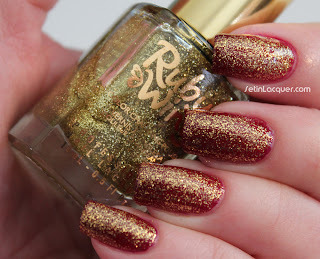 They expand your polish collection with the addition of one polish! These color changing Ruby Wing polishes can be purchased on their website for $10.